Before chasing after Pete, open the two chests on Cornerstone Hill for a Frost Shard and the Cornerstone Hill Map. Make your way to the Pier and open the chest by the tree for a Hi-Potion. Head to the far side of the area for another chest containing a Mythril Shard before speaking to Pete. Every combo will send Pete flying into the air; steer clear, as he comes crashing back down with a painful shockwave. This Pete doesn't have any of the special moves that the Pete Sora is familiar with has. He is quite easily caught in combos, though he does have an unintentional counterattack once Sora sends him flying; he will comically flip into the air, which is your cue to jump, as his landing will create a shockwave that hurts anyone nearby. When he gets back up, he'll begin to run in fear. Approach him and use the reaction command "About-Face" to block his advance, or simply continue to combo him until his small health bar is drained. 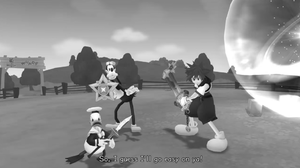 Defeating him will yield no bonuses, and a scene follows in which Sora, Donald, and Goofy doubt their actions. Use the Air Slash reaction command when the scaffolding rocks to slash at all surrounding Heartless. Enter the leftmost window to find yourself in the Building Site. 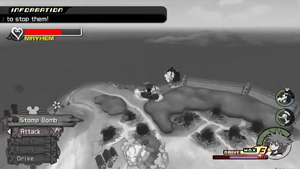 Simply clear the area of Heartless before the scaffolding can collapse (indicated by the "mayhem" gauge in the corner of the screen). The area is populated by Hammer Frame Heartless, who will try their best to smash the scaffolding before you can complete your task. 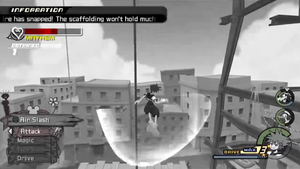 Eventually, the scaffolding will rock enough that it sends Sora and all of his enemies bouncing, in which case he can make use of the "Air Slash" reaction command in the center of the area. Return to Cornerstone Hill once the task is completed to move on to the next one. Heartless are hit by the Stomp Bomb no matter how far away they are. In the Lilliput, protect the small town from the large Aeroplane and Hammer Frame Heartless by clearing them out. Make use of the tower in the center of town with the Stomp Bomb reaction command, which stuns all surrounding Heartless by hitting them continuously into the air. Overall, this shouldn't prove too difficult, and will provide you with another scene that gives some insight on Pete. The next window places Sora at the Scene of the Fire, where he must defend the building from the small fires that approach it as well as the Heartless, the Hot Rods being the most difficult of the bunch. Summoning Chicken Little will make this task significantly easier, as he calls all Heartless to him with a whistle that keeps them away from the building. Ignore his limit and attack while Chicken Little supports you to clear the mission and move on to the next. Through the last window is Mickey's House. 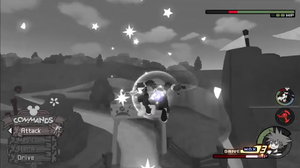 This is the easiest task, as the Heartless are the weakest of the bunch (Rapid Thrusters, which only take a few hits to defeat despite their numbers). Defeat them all before they can take Mickey's furniture to obtain the Window of Time Map. Follow Pete past the windows to the Waterway for a boss fight. Hit whatever Pete throws right back at him with the Juggle Parry/Overhand reaction command combo. 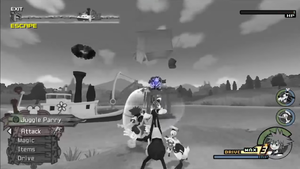 The mischievous Pete that Sora is familiar with will now attempt to escape with the Cornerstone on the steamboat, throwing large objects at Sora in an attempt to stop his pursuit. Use the Juggle Parry reaction command to block any incoming objects, and then the Overhand reaction command to toss it back at Pete. Once this is done enough times, the boat will return to shore, allowing Sora to grab onto its hook with a reaction command. 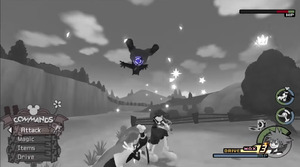 The hook will carry Sora to the cage holding the Cornerstone, which Sora can attack to bring down its HP. 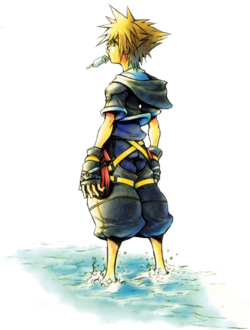 Drain its HP completely and it will break, freeing the Cornerstone and earning Sora Dodge Slash, Goofy a boost in his maximum HP, and Donald Fantasia and Auto Limit. Before pursuing Pete, open the treasure chest to the right of the Waterway by the windmill for a Frost Stone. Head left for a Mythril Stone and an AP Boost, then exit to the Wharf for another boss fight. Trap Pete in the air with aerial combos. This boss fight is unique in that it takes place across multiple areas. You will also be fighting alongside the Pete of the past against the Pete of the future. Avoid the bombs Pete drops (as well as the larger one that he rolls your way) and combo him. When he stops to guard, jump or move away, as he will stomp the ground and create a shockwave. When Pete runs off-screen, the arena will change, but his health and all other aspects of the battle will remain the same (excepting the ability to use the Air Slash reaction command at the Building Site). Feel free to make use of Valor Form if your drive gauge to land more hits on him and defeat him quicker. For defeating Pete once and for all, Sora will obtain Reflect Magic, Donald will gain a boost in his maximum HP, and Goofy will obtain Goofy Tornado. After the scenes, Sora will receive the Monochrome Keyblade for clearing the world. You can now move on to the next world, Atlantica, or if you'd rather visit Atlantica when all necessary magic is obtained, Port Royal. This page was last edited on 24 September 2017, at 19:20.